The Danish designer Arne Jacobsen believed in the artist’s complete control over a project. Though originally trained as an architect, he had a hand in all aspects of his buildings’ designs, including the interiors. His works might be considered examples of Gesamtkunstwerk, or the total work of art, because of his individual and obsessive control over every component of the design—from the doorknobs to the flatware. 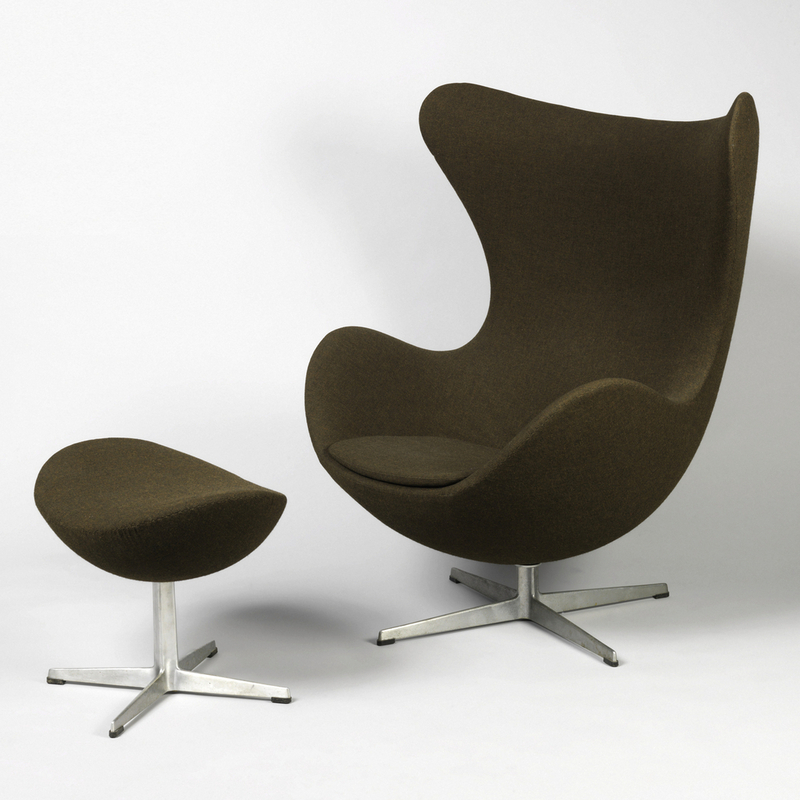 His work on the SAS Royal Hotel in Copenhagen, for which he created the Egg chair, is an example of this tendency. Jacobsen designed all aspects of the hotel, including the now-iconic chairs in the lobby, the “Swan” and the “Egg.” As the name suggests, the form is organic and fully envelopes the user. The chair’s construction relies on a curved metal skeleton with molded fiberglass shell and minimal padding, similar to the work of other midcentury modern designers such as Charles and Ray Eames and Eero Saarinen, who inspired Jacobsen’s work. There is also a sculptural quality to the chair, turning this piece of furniture into more than just an exploration in ergonomics or technological innovation—though, these elements are present, too. Jacobsen’s take on the wing chair, the encircling shape of the chair’s top is commanding, while the reliance on simple steel supports makes the chair simultaneously light and gravity-defying, ushering in a Space Age design aesthetic. There has been a resurgence in interest in Jacobsen and his contemporaries’ work. In fact, versions of his Egg chair can be found in several McDonalds fast food restaurants, in the boarding areas of some airports, as well as in the lobby of the Radisson Blu Royal Hotel, the renamed hotel in which the Egg chair originally existed.